BYN ya lo incluye en su Facebook. ¿te apetece una partidita? 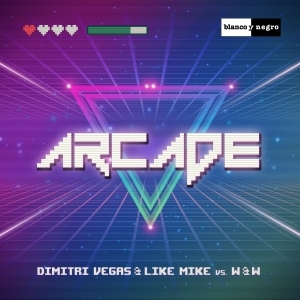 Dimitri Vegas and Like Mike vs W&W - ARCADE! Brimming with atmospheric synth blasts, a fist pumping, foot stomping beat, and the biggest breakdown of the year so far, ‘Arcade’ will undoubtedly have arenas, festival grounds and dancefloors shaking and bouncing throughout 2016. Seamlessly blending together their distinctive styles, Dimitri Vegas & Like Mike and W&W here demonstrate why they are considered amongst the biggest and best acts in the dance music sphere. Constructed with an undeniable sense of fun and nostalgia the track nevertheless retains the heavy hitting rhythms and powerful beats that have made them both acts so essential in recent years. Post was edited 1 time, last by “tomwurz” ( Feb 29th 2016, 1:17pm ). Post was edited 2 times, last by “tomwurz” ( Mar 3rd 2016, 6:37pm ). Entra en Maxima 51 Chart, al #51. Subida más fuerte de la semana en Maxima 51 Chart. ⬆15 del #51 al #36. Subida más fuerte de la semana en Maxima 51 Chart. ⬆10 del #36 al #26.